I recently returned from a three week trip to this tiny, Central-Eastern European country, original home to my husband Peter, where my parents-in-law live in a communist-relic condo building in the eastern city of Košice.”You mean Czechoslovakia?” many people ask when I explain where I’ve been and why my husband has a slight accent. No. Slovakia (Slovak Republic, officially) separated from the Czech Republic in 1993. I have to admit that I too wasn’t paying much attention at the time, but have come to learn that Slovaks are quite different from their Czech neighbors. Slovaks have a distinct identity, culture, language, and cuisine. I’ve also learned to love and appreciate many aspects of Slovak cuisine, especially those we can’t find in the US. The following are some of my favorites. Fidorka – The only way to describe this: a magical, round Kit-Kat with more chocolate and different flavored fillings, such as coconut (the best) and hazelnut. Need I say more? Parenica – Parenica is a rolled, smoked cheese, similar to the consistency of mozzarella. By rolled, I mean that it is actually rolled into the shape of a small cinnamon bun. Eating it requires unrolling the cheese and tearing off little pieces. Remember that luscious, soft cylinder in the middle of a cinnamon bun? Think of that, but made of cheese. 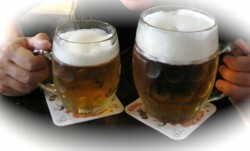 Pivo (beer) – Think you’re a die-hard ale fan? Only drink porters or IPAs? A visit to Slovakia will convince you otherwise. Pilsner there has a bite to it. It’s tasty, it’s cheaper than coffee, and it’s served in a fancy glass with 1.5″ of foam. One of my favorite brands is Zlatý Bažant. Kapusta – The direct translation is cabbage, but it also means sauerkraut, which is one of the specialties I always look forward to when I visit. While it’s a main attraction for me, sauerkraut is very commonplace in Slovak households, and most families make their own using the brine method. It is the main ingredient in Kapustnica, a traditional Christmas soup. Bryndza – Like farmer’s cheese, but made from sheep milk, this tangy soft cheese is a Slovak specialty. It makes an appearance in the Slovak national meal, Bryndzové Halušky (thin spaetzel-type dumplings coated generously in bryndza and bacon fat) and can be seen mixed with onions and paprika in a breakfast spread. Orechovník – Some love Makovník (poppyseed), and others prefer Kakaovník (cocoa). I love Orechovník (walnut). This rolled pastry is difficult to make, difficult to describe, and difficult to eat in moderation. My mother-in-law will not let us depart without it. Uhorky – It means cucumbers or pickles. I’m talking specifically about the pickled kind, and even more specifically about the pickled kind my mother and father-in-law make. Crispy, slightly tart, with notes of dill and coriander, these pickles are the only vegetable-like substance one needs in a land of dough and cheese. Borovička – I thought I hated gin, and then I tried borovička. Not to be ruined with tonic. Buck up and drink it straight, preferably after a hike through the High Tatras mountains. Too much might result in making a sport out of sprinting for city buses or ordering chicken at Tesco at 1am. However, the right amount can make you (and everyone else you’re with) very, very hilarious.